Search for the best flight prices from Manchester to Rennes. Compare prices, book today and save money with Manchester Airport. Rennes is an ancient seat of learning in the east of Brittany boasting not one but two universities. 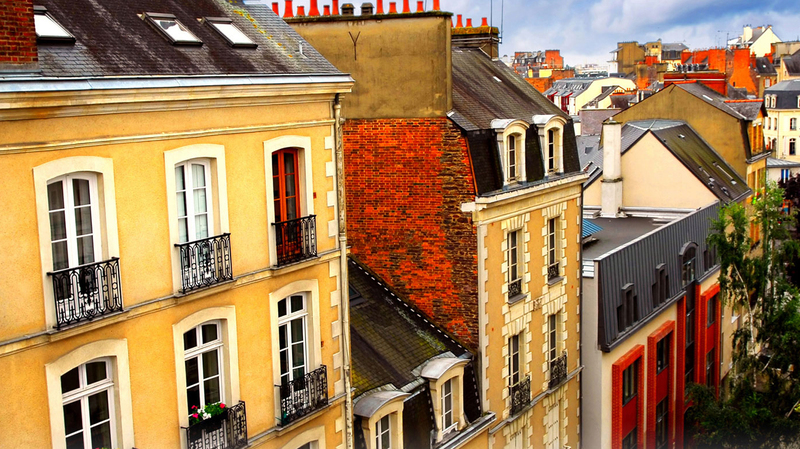 Stop a Rennais in the street and expect to hear a thing or two about history – for this is a city that has it in spades. Yet for all its gothic and medieval architecture, Rennes has a thoroughly modern outlook; optimistic, warm and welcoming. As the capital of one of France’s most individual provinces – Brittany – Rennes isn’t without a certain amount of character. It’s attractive too, and for those visitors looking for a central location, both Novotel Rennes Centre Gare (22 avenue Janvier) and Hôtel Kyriad Rennes (6 place de la Gare) have plenty to recommend them, not least close proximity to the station. The 42-room Hôtel Anne de Bretagne (12 rue Tronjolly) also enjoys a good position, while the Brit Hôtel du Stade (167 rue de Lorient), a 10-minute drive from the centre, is an option for visitors staying out of town. Much of central Rennes is pedestrianised and lined with shops, so there’s a good choice if you’re keen to purchase a gift or souvenir. North of the Vilaine River, streets like Rue d’Estrées, Rue d’Orléans and Rue la Motte Fablet are all decent bets for big-name brands, while the city’s medieval core is where to head for smaller fashion boutiques. Rennes’ shopping centres include the large Colombia Mall (Place du Colombier). For a more authentic retail experience, however, don’t miss the Saturday market known as the Marché des Lices, France’s second largest market. It’s been going since the 1600s. Brittany is renowned for everything from its cider to its chickens, so eating out in Rennes can be a pleasure. There are three Michelin-starred restaurants, including La Coquerie (156 rue d’Antrain), which relies heavily on seasonal produce and offers its own cooking classes, and Le Saison (1 impasse du Vieux Bourg), which is set in a farmhouse on the city limits. For excellent crêpes, try La Saint Georges (11 rue du Chapitre) or La Ville d’Ys (5 rue Saint-Georges), while for thoughtful French food it’s well worth booking a table at L’Ile du Mets (4 rue Descartes). France’s oldest student festival, Rock’n Solex combines Solex (powered bicycle) racing by day with live music, traditional dancing and other festivities by night. It’s been running since 1967 and takes place over five days. Comprising more than a fortnight’s worth of arts events, street performances and one-off exhibitions, Les Tombées de la Nuit (‘Nightfalls’) is renowned for its anything-goes festival spirit and its use of unusual locations. Expect everything from rooftop plays to side street circus acts. Meaning ‘young’ in Breton, Yaouank is an annual celebration of Breton music and can draw crowds of more than 10,000. It’s particularly famed for the huge ‘fest-noz’ (a traditional Breton dancing party) that takes place on the last night. A high-class showcase for dance and theatre – and subsequently attracting large numbers of directors and choreographers – the Festival Mettre en Scène originated in Rennes and has since expanded to also include other towns in the region. The city’s biggest annual musical festival, Les Rencontres Trans Musicales has a reputation for uncovering up-and-coming acts, but has also played host to the likes of Daft Punk, the Beastie Boys and the Foo Fighters. It still has a commitment to promoting new musical genres.